Pakistan 4-176 (Umar Akmal 64, Mohammad Hafeez 63, Dale Steyn 2-29) beat South Africa 4-170 (Hashim Amla 48, Jean-Paul Duminy 47*, Shahid Afridi 3-28, Saeed Ajmal 1-30) by six runs. Pakistan hammered 176 runs for the loss of just four wickets in 20 overs and South Africa reached 170 with six wickets in hand. Mohammad Hafeez (Pakistan) was declared ‘Player of the match’ and ‘Player of the series’ for his excellent batting and captaincy. The second and final Twenty20 was played on Friday, November 22, at Newlands, Cape Town. Earlier, Mohammad Hafeez, the skipper of the visitors, sent in Nasir Jamshed along with Ahmed Shehzad who were gone for 9 and 19 as the total touched 44. Mohammad Hafeez and Umar Akmal took charge and speeded up the run rate. They gathered 21 runs in the 12th over with 3 sixes and the first hit his seventh T20 fifty in the next one and Umar Akmal powered his fifth T20 half century on the 27th ball he faced. 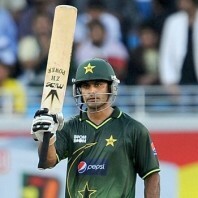 The duo shared a match winning partnership of 102 runs as Mohammad Hafeez became the next victim for 63. Umar Akmal continued with his blast and was dismissed at 64 as Pakistan piled up 176 runs with six wickets remaining in 20 overs. 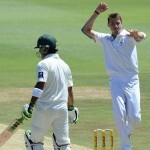 Dale Steyn was the chief wicket taker with two whereas Wayne Parnell and Aaron Phangiso held one each. Hashim Amla and Quinton de Kock started the chase smartly by scoring 53 runs in six overs. Shahid Afridi put the brakes on by dismissing de Kock and the incoming batsman, Faf du Plessis, for 26 and 6 runs. AB de Villiers was clean bowled by the same bowler for 13 and Hashim Amla was the fourth batsman who went back to the pavilion for 48 and the hosts were reeling at 4-117 in 15.3 overs. 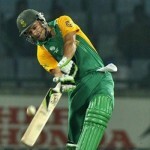 Jean-Paul Duminy and David Miller did not give up and kept on enhancing the score. Duminy was the most attacking of the two and punished the bowlers regularly. The Proteas required 17 runs from the last over by Sohail Tanvir but scored a meagre 10 and managed 4-170. Duminy and Miller remained unbeaten for 47 and 22 until the last ball of the 20th ball was bowled. Shahid Afridi was the star performer with three wickets and Saeed Ajmal took one. Pakistan clinched the match by a narrow margin of six runs and squared the series at 1-1.